Sometimes the hardest part of planning a reunion is finding the right space to host your event. Look no further, our Group Sales Department has an array of venues to help you choose the ideal location. Whether you need a quick space to host a potluck, a private restaurant to share a meal and a few drinks, or a good rate on rooms, we can help. That time consuming ordeal that you have been dreading, will become a breeze and you will be left free to enjoy your time with your friends and family. With over 3,500 rooms and an assortment of layouts to choose from, our group sales department can help you find the ideal room type. Whatever the need, we have a vast array of venues. From small intimate rooms to vast ballroom spaces, we can accommodate 10-300 people. Our resorts also offer complimentary wireless internet access and free parking. We offer an array of food & beverage outlets at each of our resort. Upon request, we can happily cater special events. Our resorts are all within close proximity to local attractions and restaurants. Our exclusive partnership with area attractions allows us to offer amazing savings to you and your group. We love our Groups! Come see why our loyal groups travel here year after year excited to experience our warm southern welcome, but also our beautiful 1.2 mile oceanfront boardwalk. We’ve got the Atmosphere, Amenities, Services and the Location your group is looking for! Our friendly group specialist take great pride in working with you, so that you and your group experience all of the marvelous things only an oceanfront property can provide! Staying with The Bay View family means you get to take advantage of our special discounted rates for groups! Ask How we can help you save on room rates and off-site fun! Our experienced group specialist are awaiting your arrival to come join us for your next group trip! Come encounter special privileges, like discounted accommodations for groups needing at least 10 rooms or more, as well as discounted dining and attractions. With a grand total of 7,200 sq-ft of event space, we take the ordinary beach experience and make it something special. Groups! Look no further! We’ve got the Atmosphere, Amenities, Services and the Location your group is looking for! Our awesome group specialist at The Caribbean Resort take pride in working with you, so that you and your group experience all of the wonderful things only an oceanfront property can provide! Come check out our spacious oceanfront pool deck, in-door pools and our famous oceanfront water slide! Challenge your group to a game of giant checkers, shuffle board or take a day to enjoy our NEW full-service spa located on the 3rd floor! Our loyal groups choose The Caribbean Resort every year for their group travel accommodations, come find out why! Located on the exciting southern end of Myrtle Beach, Groups will experience 2 on-site restaurants, the Compass Joe Coffee Shop, and an oceanfront Tiki Hut. Our polished meeting space offers an ocean view as well as your event essentials. Offering the best atmosphere, amenities, services and the location your group is looking for! Our friendly group specialist take great pride in working with you, so that you and your group experience all of the marvelous things only an oceanfront property can provide! Location and amenities are key when traveling in large groups due to the many expectations of each individual. We know sometimes half the group wants to hang at the resort, while the others want to get out and explore! Student Groups, Church Groups and Military Groups choose The Dayton House Resort for their group accommodations every year without a second thought, due to the exciting discounted dining and attractions with-in a short distance away. Why settle for ordinary when you can experience extraordinary at the Long Bay Resort? We invite all social groups, military groups, student groups, church groups or just any group needing 10 units or more. We will ensure your groups vacation is fun-filled at the best rates all year long. Our resort is situated on the northern end of Myrtle Beach, just minutes from all major attractions, shows and restaurants. Exceeding the extraordinary, North Beach Plantation is a legendary coastal location tucked away in the prestigious northern end of Myrtle Beach, SC. 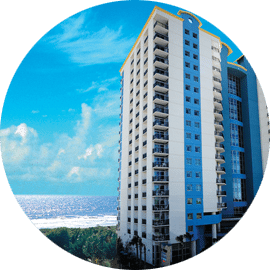 With our magnificent grand towers facing the southern Atlantic Ocean, your group will experience more than you could ever have imagined! Partnered with 21 Main Events at North Beach we specialize in events big or small! We invite you to come experience our spacious event venues designed to push the luxury limits. Let our dynamic and sophisticated event professionals take all of the work off of your hands and ensure we cap your wedding expectations! Ocean Reef Resort is far more than a resort, it’s a majestic oasis. Located on the northern end of the beach, you are only minutes from any attraction or restaurant but also nested in a quieter atmosphere ready to serve you and your needs. Conveniently located in Myrtle Beach, finding something to do off property will come easy. To top it off, we won’t let you pay retail prices for your adventures. Discounted is what your group will receive just for staying with us! Let our group specialist help suggest and reserve off-site dining and attractions while you and your group reap all of the benefits. Located in the heart of Myrtle Beach, The Strand takes group travel to the next level! Expect this property to capture all of your groups desires with our top-notch facilities, services and convenient location! Dine right on-site and enjoy a specialty cocktail in our immaculate oceanfront restaurant or recline under one of our shady oceanfront cabanas. Our divine atmosphere, amenities and services will leave your group ready to book here again year after year!